Hello 2019! Now’s the perfect time to examine your current CX strategy and to start planning for the year ahead. 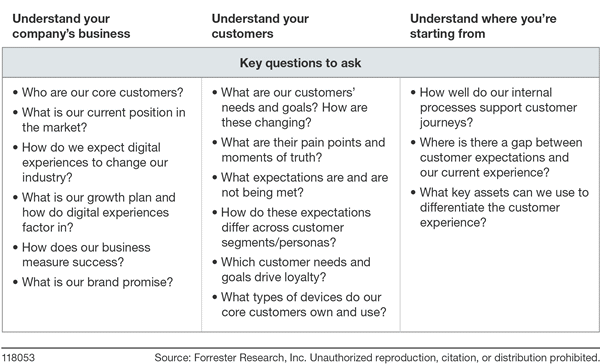 When building your new CX strategy, the first stage is to step back and review the past year. Did you meet your CX goals, or were there areas which should have got a little bit more attention? Now is the time to reflect – celebrate your successes but try to recognise your mistakes and learn from these. Your business industry climate is always changing, and your new CX strategy needs to reflect that. Research your industry, and wider economic space, to truly understand where your business sits. Catch up on webinars, blog posts, subscribe to a new industry magazine and use every opportunity to network. It’s also important to know your competitors and what experiences they offer; not only to make sure you’re not falling behind, but also to be sure that your product or service is offering a unique experience. Start by setting out a roadmap for the year ahead with key milestones and assign each goal to a specific person to be accountable for reaching it. Schedule regular catch ups to maintain momentum and to keep CX on the radar – it can be easy to lose sight of the bigger picture. Strategies also need to be forward looking and have an actionable level of detail – vague and unfocussed ideas without clear direction and measurability are far less likely to be successful. To understand whether your CX strategy is a success, you need a system in place to measure it. That goal might be a sustained increase in NPS, increased sales or a higher number of repeat purchases. This needs to be specific and relevant to your business and overall company-wide strategy – just because one company measures success with NPS does not mean it’s necessarily the right fit for your own. Customer experience strategy isn’t something that can be completed and ticked off the list in January – it’s an ongoing process and requires constant attention. Stakeholders and executives should revisit the CX strategy regularly and look for ways to manage and optimise efforts. Remember customer feedback programmes are only a success if they make a positive impact on the overall customer experience and help the organisation meet their own business objectives. Getting you setup on a demo account is as easy as 1-2-3. Just fill out this short form and one of our friendly consultants will get in touch to get the melon rolling!